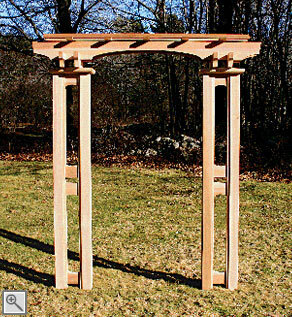 This pergola type arch, with double main beams and large rafters, commands a distinctive yet graceful presence, allowing this structure a place in either a traditional or a contemporary environment. With 4" x 4" posts, 2" x 8" rafters and double 2" x 6" support beams this strong unit creates a perfect space for the training of any number of climbing vines. 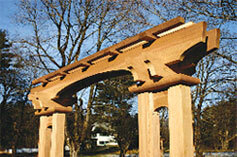 Detailed side panels, with soft arches, echo the arch within the main rafters. Shown here with the Malibu Gate, this piece would also work very well with any of our other gate and extension styles as referenced in our Arbor Gates and Extensions section. 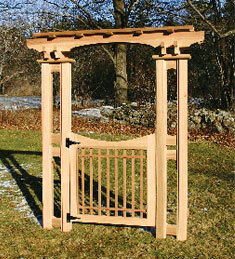 Constructed of clear, kiln dried western red cedar and stainless steel fastenings.